At a rough estimate, about 140 races were run across the nation on Saturday, including those conducted at the unique King Island meeting in Bass Strait. 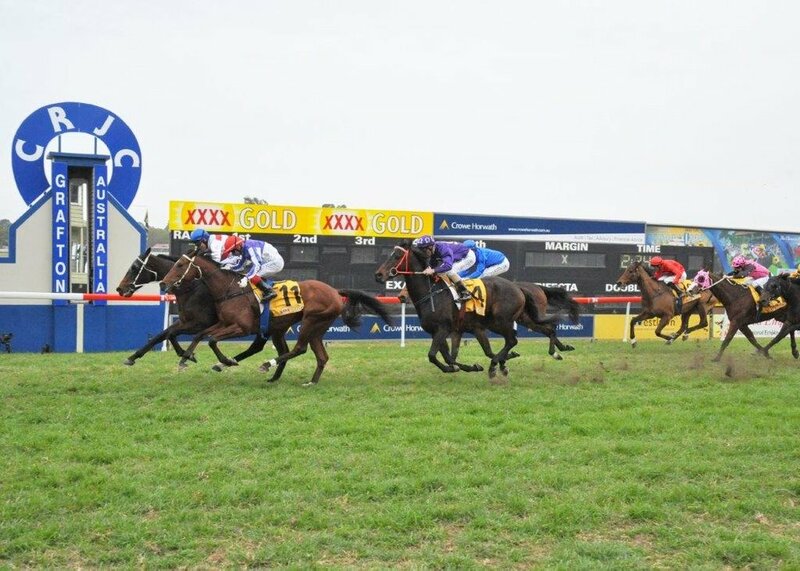 It’s possible the best ride of the day was produced by veteran Peter Graham, who landed a winning double at Tuncurry Forster on the NSW Mid North Coast. One of his winners was Oakwoods Hope in a 2100 metre Class1/Maiden for local trainer Terry Evans. Peter had ridden the mare on only one previous occasion, and had obviously concluded she was one paced. The five year old mare showed little gate speed on Saturday and was last of nine at the judge the first time where the leaders were fairly flying. The speed slackened considerably at the 1200 metres and by the time they got to the 800 they were “walking”. Peter did what few are brave enough to do in the modern era. He whipped around the field in a twinkling and once in front he made sure the chestnut mare was rolling along. He didn’t even attempt to cut back down to the fence, because he didn’t want to hinder her momentum. There were no superstars behind Oakwoods Hope, but she did win by five and a half lengths, and was the middle leg of a training treble for Terry Evans. Image courtesy Trackside Photography - Peter Graham stole this one on Oakwoods Hope at Tuncurry Forster. With many holidaymakers still on the coast, the crowd was a healthy one for a fixture promoted as “Seafood Race Day”. Club President Garry McQuillan tells me patrons purchased 100 dozen oysters and more than 300 prawn rolls, while the barbecued fish was a big hit. The Tuncurry Forster Racing Club hosts five meetings a year, on a track described by jockeys as the “Randwick of the North”. Easy access to internet race replays has been a plus for form students, but a source of worry to modern day jockeys. In the pre video era, jockeys would frequently make an unexpected move, which often resulted in victory. If the tactics failed to come off, the jockeys didn’t have to incur the wrath of punters and connections, whose frustration had been inflamed by countless replays. Image courtesy Trackside Photography - Peter after yet another win on the NSW north coast. Peter Graham has made the right move more often than not, resulting in a career which has yielded around 2300 winners. He’s had no desire to leave the beautiful NSW coast, and has plied his trade for thirty five years at meetings within striking distance of his Port Macquarie base. Peter was born and reared at Wauchope and was originally apprenticed in his hometown to Bob Graham (no relation). After three years with Bob, Pete transferred to the late Noel McInerney at Muswellbrook, where he had access to a wider group of experienced horsemen. “In my very early days at Wauchope I never really had a riding tutor”, recalled Graham. “I virtually had to teach myself and it took a long time for me to develop as a jockey”. For many years now, Peter has been one of the busiest riders in his region and has enjoyed the respect of a wide range of owners and trainers. His integrity has always been beyond question and this very point triggered his indignation, when one of his rare city rides was queried by Racing NSW stewards recently. Peter rode Haames in a TAB Highway event at Randwick and stewards wanted to know why he persisted for a run on the inside of Guided coming to the hometurn, when he could have come to the outside. The jockey admitted it had been an error of judgement, but was offended by the duration and intensity of the investigation. It was a proud day for Peter Graham in May of 2017, when he rode on the same programme at Port Macquarie with his son Jesse and daughter Cejay. Jesse rode a good number of winners before his weight got out of hand. “He was very promising, but suddenly discovered there was a lot more to life than racing”, said Peter. Jesse and Cejay were both indentured to John Sprague at Port Macquarie. When Cejay started to ride trackwork, Dad became her official tutor. “I rode work with her for almost two years, and I could see she was going to make the grade”, said Peter. Image courtesy Trackside Photography - A proud Dad with son, Jesse, and daughter Cejay at Port Macquarie 2017. Cejay Graham was on the crest of a wave when she sustained a nasty wrist injury in a fall at Grafton. Plates were inserted in a delicate operation and further surgery was required to remove the plates some time later. “She missed a lot of time, but it hasn’t dampened her spirit”, said Peter. “She’s back riding winners, and still has a 1.5kg claim. She’s barely 46kgs, so expect to see her around for a long time”. Peter made a surprise statement over the weekend when he told me that his youngest daughter Rori, could be the best rider ever seen in the family. “She’s only 14, weighs about 30kgs and can ride anything”, said a proud Dad. “She was a whiz at pony club and you should see her on a show jumper. She hasn’t even hinted she might like to be a jockey one day and I’m certainly not pushing her”. Peter’s wife Sally is resigned to whatever fate decrees. She was a proficient rider as a youngster and understands the family obsession with horses. “She follows the horses Cejay and I ride and is rarely far away from the Sky Channel screen”, says Pete. Peter Graham has won a string of country cups, with Kempsey being his happy hunting ground. Sky correspondent Gary Kliese, reckons he’s won six Kempsey Cups, but so far has been unable to snare a Port Macquarie Cup. “I haven’t given up. 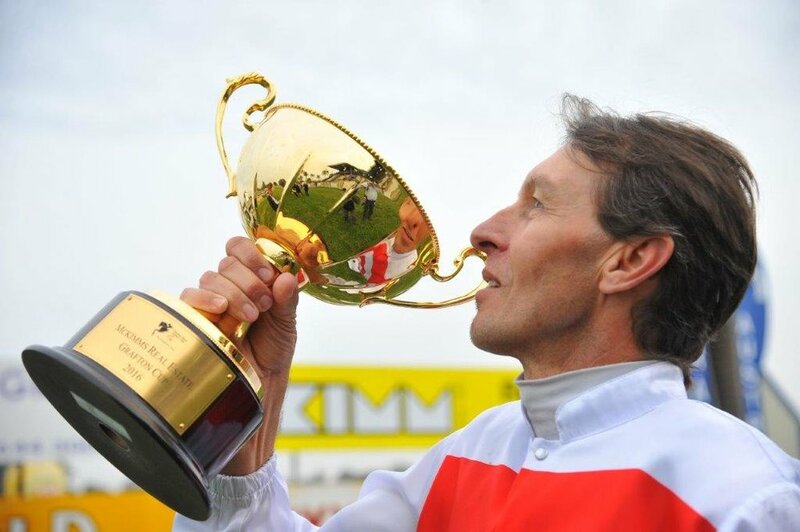 I intend to ride for a while yet, so a Port Macquarie Cup isn’t mission impossible”, said Peter. The popular jockey got a very big kick out of his Grafton Cup win on Rednav in 2016 - the middle pin of a hat trick. Young trainer Sally Taylor prepared Rednav to win a Cup Prelude, followed by the Cup itself and an Open Hcp at Doomben, with P.Graham doing the honours in all three. Image courtesy Trackside Photography - Peter gets Rednav home narrowly in the Grafton Cup. The Grahams live on a ten hectare farm on the outskirts of Port Macquarie, purchased from former trainer Reg Rowley. The property boasts twelve horse boxes, a walking machine and sand roll. These facilities have given Peter food for thought. “I’m giving serious thought to applying for one of the new dual licences recently approved by Racing NSW”, revealed Peter. “I’ve never considered training racehorses, but that may change. I’d enjoy training two or three for Cejay to ride, and the old man could jump on from time to time”. Talking to Peter you get the impression he’ll be around for some time to come. The fifty year old enjoys loyal support from owners and trainers, and manages his weight comfortably. He rides a little “longer” than most of his contemporaries and could easily pass for a product of another era. Long “leathers” or short, he’s as sharp as ever and his brilliant ride at Tuncurry Forster was the work of a highly experienced tradesman. Brilliant enough to get him “ride of the day” in this race mad nation. Image courtesy Trackside Photography - How sweet it is. Pete with the 2016 Grafton Cup.